Paneurhythmy is a joyful, meditational dance-exercise which has a profound philosophy associated with it. It was created by the Bulgarian Teacher Beinsa Duono in the Rila mountains at the beginning of the 20th century. Literally, the word Paneurhythmy, means ‘Supreme Cosmic Rhythm’. Working with the energies of Nature, it is danced outside, in the mornings, between spring and autumn equinoxes. The simple graceful movements each have a deep meaning and healing power on the dancers and the environment. During the weekend, the singing will involve learning and sharing simple songs, chants and harmonies. The emphasis will be on sounding from the heart of our being. This helps us each to open our heart centre so that we can individually and collectively connect with the flow of Universal Love. When this is done in harmony with Nature, we can make a heartfelt offering to the land and to all who are sustained by it. We are fortunate to be able to use Colwood House, the private home of Rosy Brenan, as our home for this weekend. The house has a garden which is sublimely beautiful. In geomantic terms, this area, between and including the hills of the North and South Downs, forms the land focus of the veil of what has been called the “Grail Land of Europe”. For more information on this, see http://www.zoence.co.uk/info-landscape/Grail_Land_of_Europe.pdf. The veil, which also includes the English Channel, lies between the solar plexus chakra of the Grail Land, focussed on Chartres in northern France and the heart chakra, focussed on London. The theme of this weekend is nurturing friendship between Britain and mainland Europe and between the constituents of the British Isles. Colwood House has 12 acres of garden with mature and specimen trees from the late 1800s, lawns and woodland edge. There is a rose garden, herb garden, herbaceous borders, a cut turf labyrinth and a small lake with an island and temple. The grounds form a complete natural temple with its own chakra system. Friday evening – we will introduce the weekend. 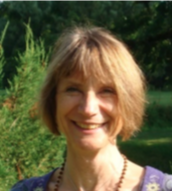 Saturday morning – Sarah will teach Paneurhythmy and Andrew will guide us in singing from the heart. Saturday afternoon – we will explore the theme of friendship using song and dance in Nature. 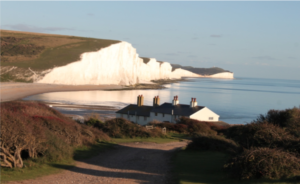 Sunday – we will share what we have learnt and created with the wider landscape including visits to Brighton beach, Seaford Head, with stunning views of the white cliffs known as The Seven Sisters, and the ruins of Lewes Priory. The event will conclude with a late lunch in Lewes. Accommodation will be in Colwood House and local B&B’s. Places are limited. Travel during the weekend will be by shared private cars. Comfortable walking shoes and good all weather protection are essential. The final plans will depend on the weather! Residential: £235 Non-residential: £175 payable to Zoence Academy (Sort Code: 30 98 26 Account number 01173783). Cost includes: Friday night supper, breakfasts, Saturday lunch and refreshments. Saturday night supper at a local pub and Sunday lunch in Lewes will be at our own cost. Concessions may be available. Colwood House, RH17 5SP, is near the village of Warninglid, 6 miles from Hayward’s Heath rail station, which is on the mainline from London Victoria and London Bridge stations. Gatwick Airport is 13 miles away. At the conclusion of the weekend in Lewes, lifts back to Colwood House will be available. Those returning to London may want to travel from Lewes rail station which also connects with London Victoria and London Bridge stations. Sarah Dawkins first danced Paneurhythmy in 1980s, learning the movements through the Scottish School of Paneurhythmy which brought Bulgarian dancers and musicians to Scotland. Sarah has travelled several times to Bulgaria to dance in the Rila mountains and has incorporated the dance into many pilgrimages which she focalises alongside her husband, Peter Dawkins, throughout Britain and Europe. Full details of all the events Sarah is involved with are on www.zoence.co.uk. 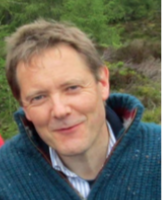 Andrew Clark worked for nearly 30 years as a psychiatrist and psychotherapist in the NHS, before retiring in 2017. Since 1990, he has participated in pilgrimages and retreats led by Peter and Sarah Dawkins, as well as having experience of co-leading pilgrimages. He has sung in choirs for many years and feels increasingly called to use heart-centred singing and sounding as a way to develop our heart consciousness.